After leaving office in 2017, Vice President Joe Biden Bragged about strong-arming the government of Ukraine to fire its top prosecutor. Joe Biden made the remarks during a meeting of foreign policy specialists. Biden said he, “Threatened Ukrainian President Petro Poroshenko in March 2016 that the Obama administration would pull $1 billion in U.S. loan guarantees, sending the former Soviet republic toward insolvency, if it didn’t immediately fire Prosecutor General Viktor Shokin.” Biden suggested during his talk that Barack Obama was in on the threat. On Wednesday John Solomon revealed what Biden did not tell his audience. 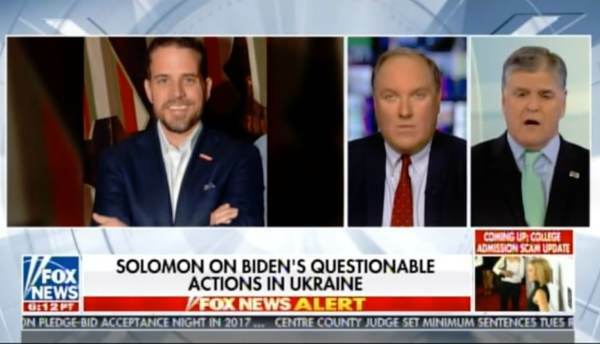 Joe Biden had Poroshenko fired because he was investigating Joe Biden’s son Hunter. Poroshenko was investigating $3 million in funds that were being transferred out of Ukraine and into accounts in the United States at that time. Joe Biden had him fired. John Solomon joined Hannity to drop this bomb on the Biden family.